We were working in Baga Oigor II when I heard my husband yelling from above, “Esther, get up here, fast!” Thinking he had seen some wild animal on a high ridge, I scrambled up the slope. There, at the back of a protected terrace marked by old stone mounds was a huge boulder covered with hundreds of images. Within that maze of elements I could distinguish a hunting scene and several square patterns suggesting the outlines of dwellings. 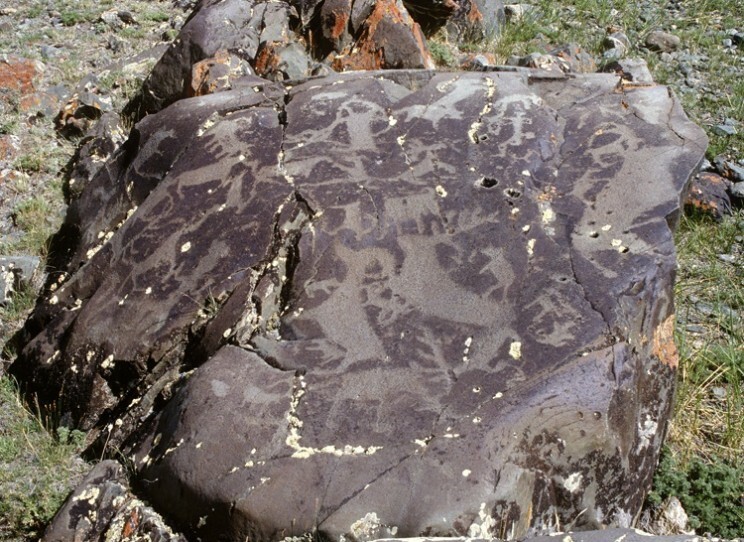 The most remarkable scene, on the left half of the boulder, included several profile elk and frontal birthing figures. Stylized, crude, this pairing of stags and female figures rendered me speechless. 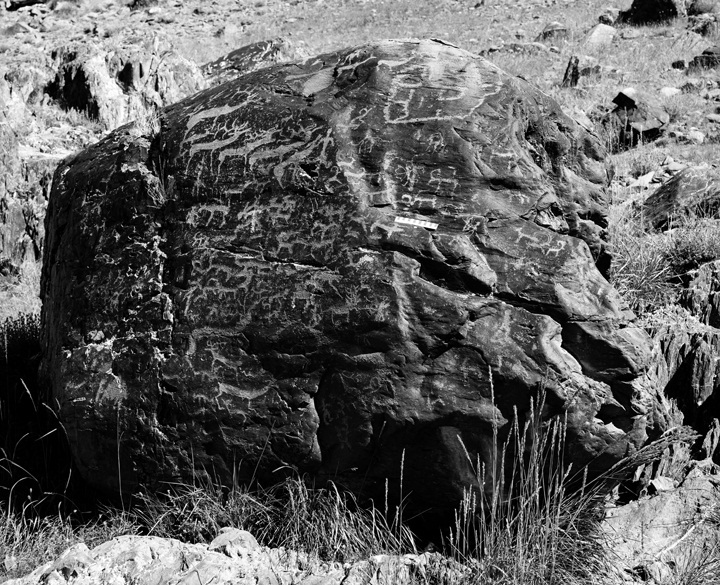 In one moment a rough boulder had crystalized and drawn together so many of the tropes I had earlier noted in this and other rock art complexes of the Altai—hunters and animals suggesting the bounty of nature, malevolent wolves, the signs of home and well-being, and most importantly an essential connection between birthing women and wild animals. This boulder became the lynchpin in an inquiry in which I may have been the discoverer — but which actually taught me how to look and think about the archaeology of belief. 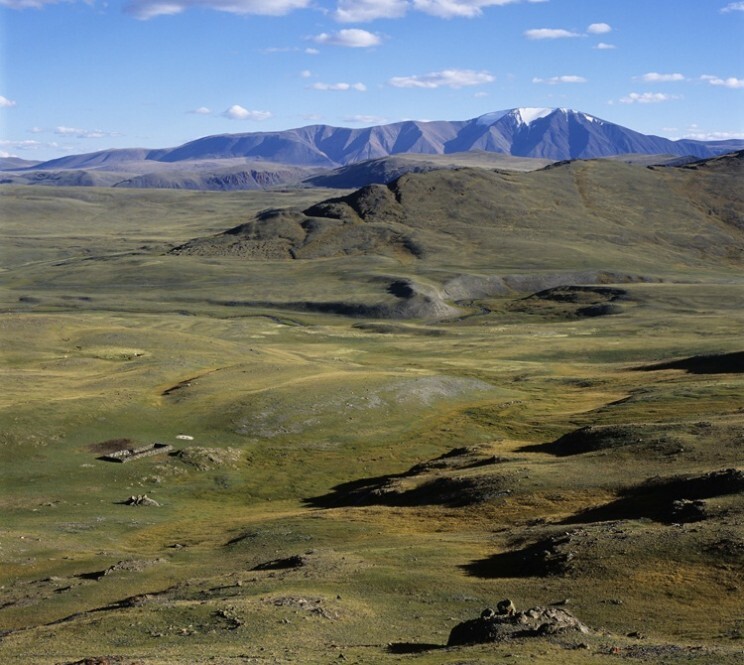 Our project was located in northwestern Mongolia where the Altai Mountains spill over into Russia and China. In that vast and seemingly empty landscape we discovered huge repositories of ancient rock art and surface monuments dating back to the Bronze Age and earlier, virtually all unknown to any but local herders. Our ostensible purpose was to survey, record, and document this material. But gnawing at me always was the question, is it possible to see a pattern in the complicated procession of cultural tropes and periods? How do the images and surface monuments relate, finally, to the immense landscape in which they have survived for thousands of years? And how does one begin to reconstruct the lives and beliefs of ancient cultures in the absence of written texts? 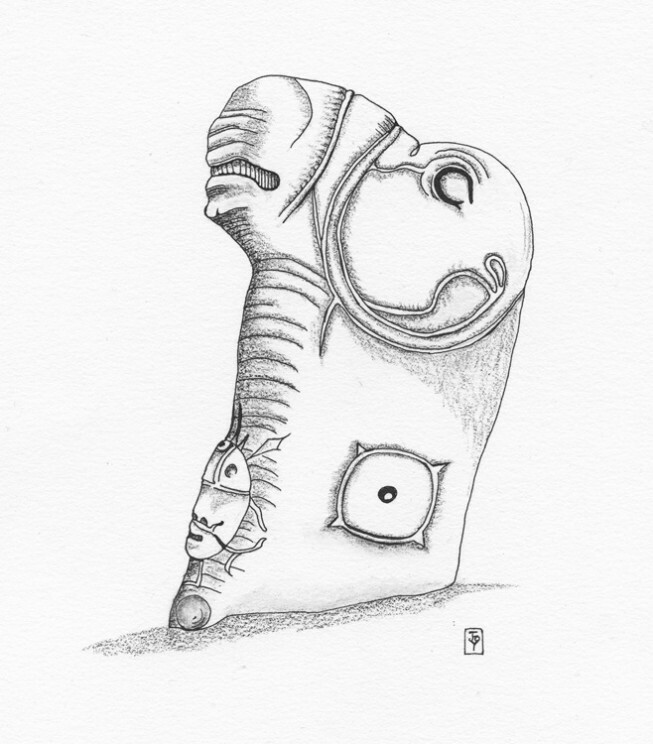 By the time we discovered the boulder at Baga Oigor II, I was already familiar with massive stones from the Minusinsk Basin, carved with the masks of horned animals, the jaws of ferocious beasts, and female breasts. I had earlier been drawn to the pecked images of female moose, striding above the rivers of the Siberian taiga, and to bird-women from Kalbak-Tash. These strange beings—so often of a distinctly female character—as well as standing stones, great mounds and elaborate altars, suggested a cultural river that flowed over a vast region of northern Asia, its currents shifting with space and time. This land of rivers, taiga, and steppe had been populated by prehistoric hunters and herders over thousands of years. They moved through forests following wild animals, fished in cold rivers, or drove their animals from lowland to highland pastures in a regular seasonal rhythm. Some of these people left behind poor burials and settlement sites; most seem to have disappeared without a trace within a land that until the twentieth century seemed empty, without visible human roots, deeply impressive and strangely silent. But that appearance of emptiness is misleading. From as early as 11,000 years before the present, within this vast and harsh landscape people were erecting monumental stones and mounds and recording their world, their ways of life, their spirit figures, and heroic narratives in stone-pecked imagery. These are the materials I gathered over a period of twenty years of fieldwork; they are the texts to which I turned in order to understand the human, expressive life of ancient North Asia. Over time I began to discern the outlines of a mythic narrative of birth, death, and transformation generated by the realities of ancient hunters’ and herders’ lives. Of the central protagonists, we have tended to privilege the hero hunter of the Bronze Age and his re-incarnation as a warrior in the Iron Age. But before him and, in a sense, behind him was a female power, half animal, half human. She was the source of life and death, the guardian of the road to the lands of the dead. From her came permission to hunt the animals of the taiga, and by her they were replenished. She was the source of the hunter’s success and thus the mainstay of a peoples’ existence. Within this tale, the stag was a latecomer, a complex symbol of death and transformation embedded in what ultimately became a struggle for priority between female deity and hero hunter. My approach is rooted in the conviction that human expression is shaped by ecological processes in its emergence, development, and disappearance. Viewed within integrated compositions, set within postural and spatial indications of action and response, the changing details of pecked imagery reflect dynamically shifting constructs in the way people oriented themselves to each other, to their past, and to their physical world. No less important is the location of monuments in their landscapes: their immediate placement, their orientation, and what they “see” from their site. With time it became clear that this magnificent but somehow mute material had to be considered in ecological terms, where change in one area shifts the interrelationships of the constituent parts and their basic signification. This study has required a wide-ranging inquiry into the visual material itself—both excavated and found in situ; into the region’s paleoenvironment, social economy, and social order. 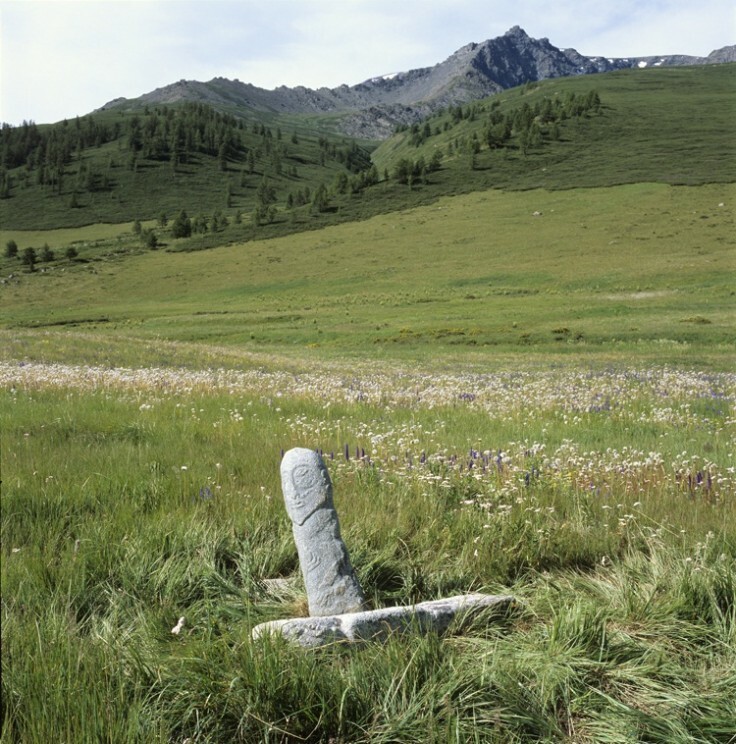 It has necessitated an investigation into the mythic beliefs and shamanic practices of Paleo-Siberian and Tungusic groups whose origins go back to the Sayan and Altai regions in the Bronze Age. Within these beliefs and practices can be found signs of patterns that parallel and lend credence to what we perceive within the ancient rock art and standing stones. 1. 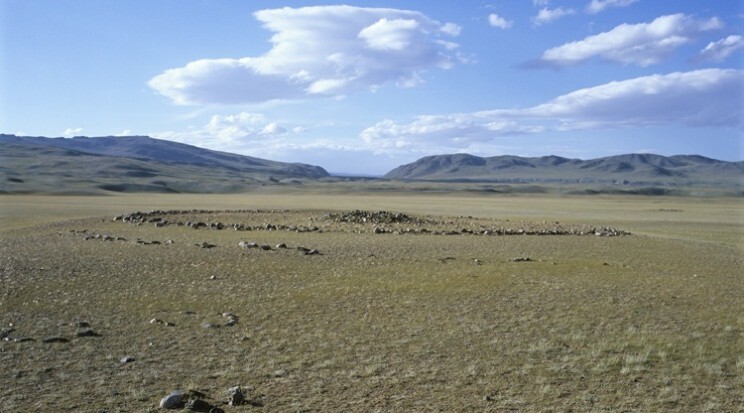 View southwest over steppe of Baga Oigor Gol, Bayan Ölgiy aimag, Mongolia. Photo: Gary Tepfer. 2. Boulder with hunting scenes, dwellings, stags, and birthing women. Late Bronze Age. Baga Oigor II, Bayan Ölgiy aimag, Mongolia. Photo: Gary Tepfer. 3. 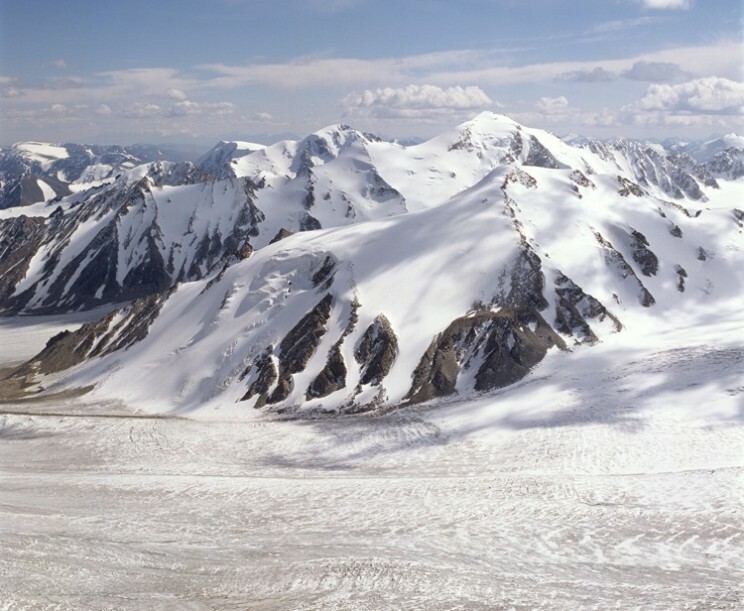 Tavan Bogd and the Potanin Glacier at the juncture of Mongolia, Russia, and China. Photo: Gary Tepfer. 4. Monolith with ram head, female mask, and breasts. Verkh-Bidzhin, Ust’-Abakan Region, Khakassia, Russia. Red sandstone, 150 x 55 x 32 cm. 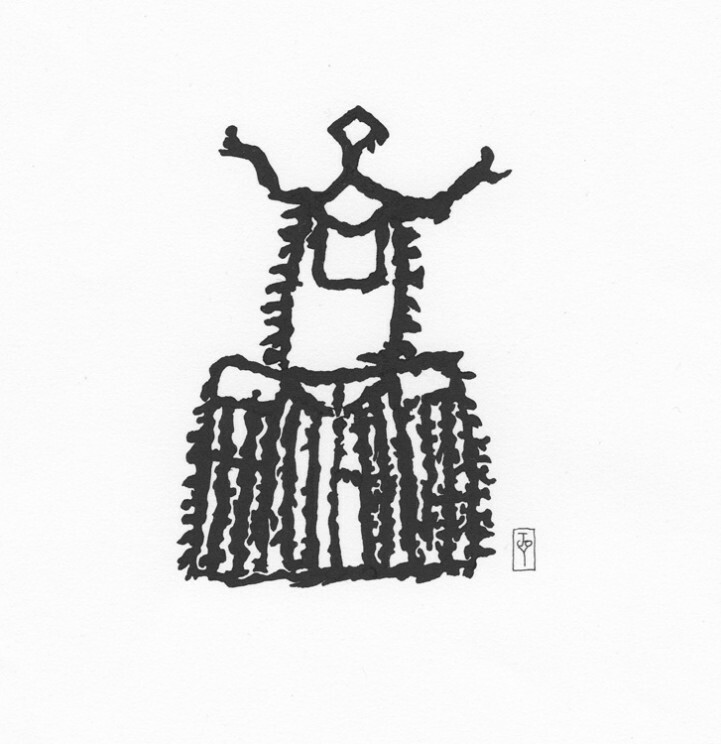 Drawing: L.-M. Kara, after Kyzlasov 1986. 5. Bird-woman with raised arms. 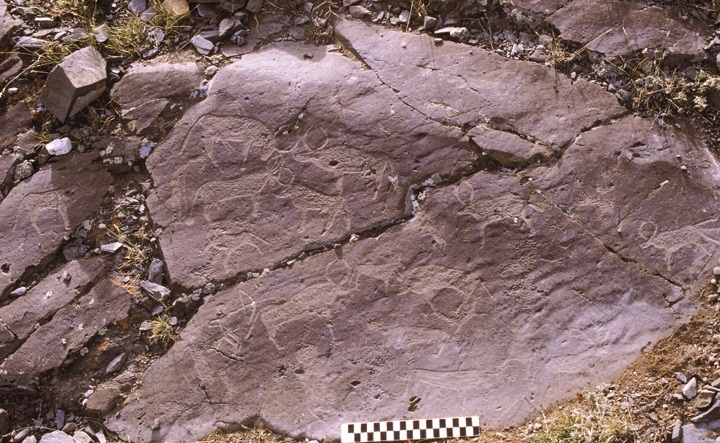 Petroglyph, approximately 30 cm. Kalbak-Tash, Altai Republic, Russia. Drawing L.-M. Kara, after Kubarev and Jacobson 1996. 6. Deer stones seen from north to south. Tsagaan Asgaat, Bayan Ölgiy aimag, Mongolia. Photo: Gary Tepfer. 7. Khirigsuur with stone altars on the south side. View to the north. Bronze Age. Dood Khalga, Bayan Ölgiy aimag, Mongolia. Photo: Gary Tepfer. 8. Boulder covered with animals, hunters, and a frontal birthing woman (left side). Bronze Age. Tsagaan Salaa IV, Bayan Ölgiy aimag, Mongolia. Photo: Gary Tepfer. 9. Scene with hunter and frontal woman (lower left) and aurochs or wild yak. Bronze Age. Baga Oigor III. Bayan Ölgiy aimag, Mongolia. Photo: Gary Tepfer. 10. Standing and fallen stone images. Turkic Period. Elt Gol, Bayan Ölgiy aimag, Mongolia. Photo: Gary Tepfer. Feature Image: Suvarga khairkhan (3) by Jargalsaikhan Dorjnamjil. CC BY-ND 2.0 via Flickr. Esther Jacobson-Tepfer is Maude I. Kerns Professor Emeritus in the Department of the History of Art and Architecture, University of Oregon. She is the author of many books and articles on the ancient art and archaeology of Mongolia and South Siberia. 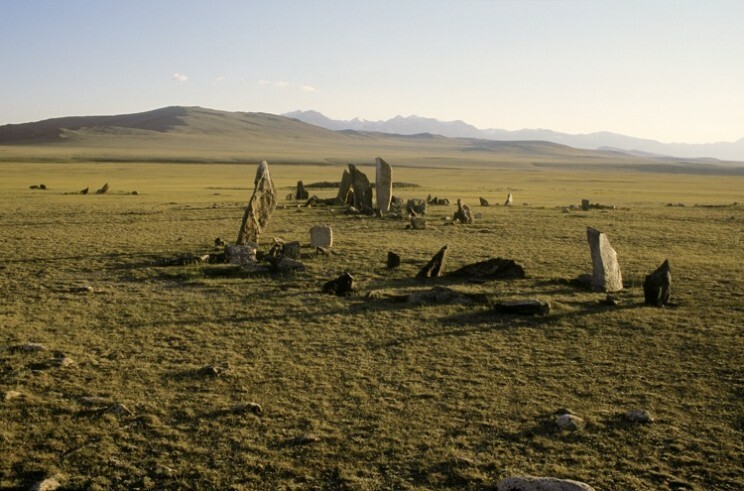 Her book (with James Meacham and Gary Tepfer), Archaeology and Landscape in the Mongolian Altai: an Atlas, received the AAG’s Globe Book Prize in 2010. 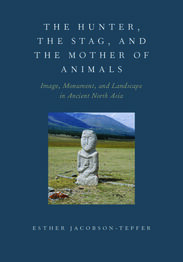 Her most recent work is The Hunter, the Stag, and the Mother of Animals: Image, Monument, and Landscape in Ancient North Asia.